The MP5 (German: Maschinenpistole 5) is a 9x19mm Parabellum submachine gun, developed in the 1960s by a team of engineers from the German small arms manufacturer Heckler & Koch GmbH (H&K) of Oberndorf am Neckar. There are over 100 variants of the MP5, including some semi-automatic versions. The MP5 is one of the most widely used submachine guns in the world, having been adopted by 40 nations and numerous military, law enforcement, intelligence, and security organizations. It was widely used by SWAT teams in North America, but has largely been supplanted by AR-15 variants in the 21st century. In 1999, Heckler & Koch developed the Heckler & Koch UMP, the MP5's successor; both are available as of 2019[update]. In 1980, the MP5 achieved iconic status as a result of its use on live television by SAS commandos in Operation Nimrod, where they stormed the Iranian Embassy in London, rescuing hostages and killing five terrorists. The MP5 has become a mainstay of SWAT units of law enforcement agencies in the United States since then. However, in the late 1990s, as a result of the North Hollywood shootout, police special response teams have supplanted most MP5s with AR-15-based rifles. The MP5 is manufactured under license in several nations including Greece (formerly at EBO – Hellenic Arms Industry, currently at ΕΑΣ – Hellenic Defense Systems), Iran (Defense Industries Organization), Mexico (SEDENA), Pakistan (Pakistan Ordnance Factories), Saudi Arabia, Sudan (Military Industry Corporation), Turkey (MKEK), and the United Kingdom (initially at Royal Ordnance, later diverted to Heckler & Koch Great Britain). The adjustable iron sights (closed type) consist of a rotating rear diopter drum and a front post installed in a hooded ring. The rear sight is mechanically adjustable for both windage and elevation with the use of a special tool, being adjusted at the factory for firing at 25 metres (27 yd) with standard 8 grams (123 gr) FMJ 9×19mm NATO ammunition. The rear sight drum provides four apertures of varying diameters used to adjust the diopter system, according to the user's preference and tactical situation. Changing between apertures does not change the point of impact down range. 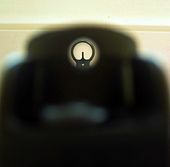 For accurate shooting the user should select the smallest aperture that still allows an equal circle of light between the rear sight aperture and the outside of the front sight hood ring. The non-reciprocating cocking handle is located above the handguard and protrudes from the cocking handle tube at approximately a 45° angle. This rigid control is attached to a tubular piece within the cocking lever housing called the cocking lever support, which in turn makes contact with the forward extension of the bolt group. It is not however connected to the bolt carrier and therefore cannot be used as a forward assist to fully seat the bolt group. The cocking handle is held in a forward position by a spring detent located in the front end of the cocking lever support which engages in the cocking lever housing. The lever is locked back by pulling it fully to the rear and rotating it slightly clockwise where it can be hooked into an indent in the cocking lever tube. In the early 1970s, HK introduced a conversion kit for the MP5 that enables it to use rimfire ammunition (.22 LR). This unit consists of a barrel insert, a bolt group and two 20-round magazines. This modification reduces the cyclic rate to 650 rounds/min. It was sold mostly to law enforcement agencies as a way to train recruits on handling the MP5. It used ammunition that was cheaper and had a lower recoil than 9×19mm Parabellum. This reduced training costs and built up skill and confidence in the operators before transitioning them to the full-bore model. Authorised Firearms Officers standing guard at the entrance to Downing Street, London, home of the UK Prime Minister. This officer is attached to the Diplomatic Protection Group and is carrying a semi-auto MP5SFA3. 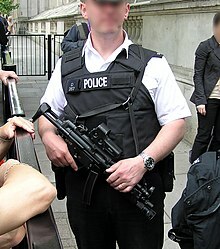 The semi-automatic "MP5SF" models are widely use by British police forces including London's Metropolitan Police Service Specialist Firearms Command, Diplomatic Protection Group, Authorised firearms officers, and the Police Service of Northern Ireland to name a few. In 1974, H&K initiated design work on a sound-suppressed variant of the MP5, designated the MP5SD (SD—Schalldämpfer, German for "sound suppressor"), which features an integral but detachable aluminium sound suppressor and a lightweight bolt. The weapon's 146 mm (5.7 in) barrel has 30 2.5 mm (0.1 in) ports drilled forward of the chamber through which escaping gases are diverted to the surrounding sealed tubular casing that is screwed onto threading on the barrel’s external surface just prior to the ported segment. The suppressor itself is divided into two stages; the initial segment surrounding the ported barrel serves as an expansion chamber for the propellant gases, reducing gas pressure to slow down the acceleration of the projectile. The second, decompression stage occupies the remaining length of the suppressor tube and contains a stamped metal helix separator with several compartments which increase the gas volume and decrease its temperature, deflecting the gases as they exit the muzzle, so muffling the exit report. The bullet leaves the muzzle at subsonic velocity, so it does not generate a sonic shock wave in flight. As a result of reducing the barrel's length and venting propellant gases into the suppressor, the bullet's muzzle velocity was lowered anywhere from 16% to 26% (depending on the ammunition used) while maintaining the weapon’s automation and reliability. The weapon was designed to be used with standard supersonic ammunition with the suppressor on at all times. The MP5SD is produced exclusively by H&K in several versions: the MP5SD1 and MP5SD4 (both have a receiver end cap instead of a buttstock), MP5SD2 and MP5SD5 (equipped with a fixed synthetic buttstock) and the MP5SD3 and MP5SD6 (fitted with a collapsible metal stock). The MP5SD1, MP5SD2 and MP5SD3 use a standard 'SEF' trigger group (from the MP5A2 and MP5A3), while the MP5SD4, MP5SD5, and MP5SD6 use the 'Navy' trigger group—a trigger module with a mechanically limited 3-round burst mode and ambidextrous selector controls (from the MP5A4 and MP5A5). A suppressed version was produced for the U.S. Navy—designated the MP5SD-N, which is a version of the MP5SD3 with a retractable metal stock, front sight post with tritium-illuminated dot and a stainless steel suppressor. This model has a modified cocking handle support to account for the slightly larger outside diameter of the suppressor. 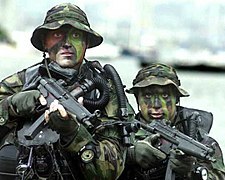 The design of the suppressor allows the weapon to be fired with water inside, should water enter the device during operation in or near water. In 1976, a shortened machine pistol version of the MP5A2 was introduced; the MP5K (K from the German word Kurz = "short") was designed for close quarters battle use by clandestine operations and special services. The MP5K does not have a shoulder stock (the receiver end was covered with a flat end cap, featuring a buffer on the inside and a sling loop on the outside), and the bolt and receiver were shortened at the rear. The resultant lighter bolt led to a higher rate of fire than the standard MP5. The barrel, cocking handle and its cover were shortened and a vertical foregrip was used to replace the standard handguard. The barrel ends at the base of the front sight, which prevents the use of any sort of muzzle device. In 1991, a further variant of the MP5K was developed, designated the MP5K-PDW (PDW—Personal Defense Weapon) that retained the compact dimensions of the MP5K but restored the fire handling characteristics of the full-size MP5A2. The MP5K-PDW uses a side-folding synthetic shoulder stock (made by the U.S. company Choate Machine and Tool), a "Navy" trigger group, a front sight post with a built-in tritium insert and a slightly lengthened threaded, three-lug barrel (analogous to the MP5-N). The stock can be removed and replaced with a receiver endplate; a rotary drum with apertures from the MP5A2 can also be used. In 1992, Heckler & Koch introduced the MP5/10 (chambered in 10mm Auto) and MP5/40 (chambered for the .40 S&W cartridge), which are based on the MP5A4 and MP5A5. These weapons were assembled in fixed and retractable stock configurations (without a separate designation) and are fed from translucent 30-round polymer box magazines. These weapons include a bolt hold-open device, which captures the bolt group in its rear position after expending the last cartridge from the magazine. The bolt is then released by pressing a lever positioned on the left side of the receiver. Both weapons use a barrel with 6 right-hand grooves and a 380 mm (1:15 in) twist rate, and like the MP5-N, both have a 3-lugged muzzle device and a tritium-illuminated front sight aiming dot. Problems with the MP5/10 and MP5/40 led to their discontinuation in 2000, although Heckler & Koch continues to provide support and spare parts. HK54: The original model that was produced in 1964. The 54 designation is from the Hecker & Koch company's old system that indicates that it is a submachine gun/assault carbine (5-) chambered for the 9×19mm cartridge (-4). It had a charcoal-gray phosphated finish rather than the matte-black lacquered finish used on later models and had narrow slotted metal handguards. Its major differences were that it had a longer and heavier bolt carrier than the MP5 and a flip up "ladder"-style rear sight (like the early G3 rifle) rather than the MP5's aperture sight. Its original 15- or 30-round steel magazines were straight rather than curved, had a plastic follower, and were reinforced with ribs (thus their nickname of "waffle"-type magazines). MP5: A slightly modified version of the HK54 first created in 1966. A matte-black lacquered finish instead of the grayish phosphated finish was introduced for export models in 1977. It originally had the narrow checkered metal "Slimline" handguards in the place of the HK54's narrow slotted metal ones. These were later replaced by the thicker "Tropical" handguards in 1978. The proprietary Heckler & Koch "claw mount" rails for mounting optical and electronic scopes were added around 1973. The improved 15- and 30-round magazines were adopted in 1977; they were curved, had unribbed sides, and had chromed-steel followers. MP5F: Model developed in 1999 specifically for the French military. Rubber-padded retractable stock, ambidextrous sling loops/bolts and internal modifications to handle high-pressure ammunition. 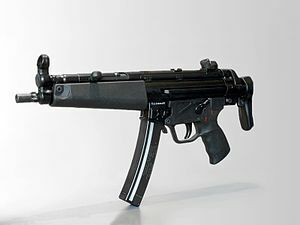 HK94: American import model of the MP5 with an exposed 16.54-inch [420mm] barrel and special SF (safe/semi-automatic) trigger group, designed for civilian use. The 94 factory designation code indicates that it is a semi-auto only Sporting Rifle (9-) chambered for the 9x19mm Parabellum cartridge (-4). The HK94/SG-1 (Scharfschützengewehr, "sharp-shooting rifle") was designed for short-range sniping in built-up areas like cities or prisons. It proved to be unsuitable for its designed purpose, due to its poor penetration and stopping power, and most went to target shooters and collectors. It had a fixed match stock with a rubber buttpad and an adjustable cheekpiece, folding bipod, flash hider, and a 6 × 42mm Leupold VIII Adjustable Objective scope. It had an overall length of 40.39 inches [1026mm] and a weight of 9.25 lbs. [4.2 kg]. Its mean standard retail price (MSRP) in 1986 was US$1,525; this was more than twice what a stock HK94A2 (US$650) or HK94A3 (US$720) cost. Only 50 were imported into the United States; authentic models have serial numbers running in the 43XX range. SP89: Sportpistole M1989. Semi-automatic only version of the MP5K designed for civilian use. It lacked a vertical foregrip to make it compliant with the National Firearms Act. It was made from 1989 to 1994. SP5K: First introduced in 2016, the SP5K is an updated version of the SP89. It features a Picatinny rail mounted on the top of the receiver for mounting accessories. As with the SP89, it is semi-automatic only and the forward handguard does not have a vertical foregrip. MP-10: A Filipino submachine gun manufactured by Special Weapons Inc. based on the MP5. The SP-10 is a civilian semi-auto copy. OFB Anamika 9mm: Indian Ordnance Factory copy of MP5. China: Norinco make unlicensed copies of the MP5A4, as the NR-08 and NR-08A, and the MP5A5, as the CS/LS3. South Africa Special Task Force of the South African Police Service MP5-N 9 mm  "South African Police Special Task Force website". An American Air Force Air Traffic Control Detachment officer fires an MP5K at the Baghdad International Airport firing range. 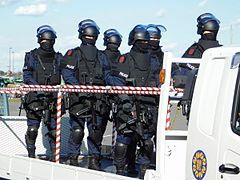 Anti-Firearms Squad of Japan armed with MP5 submachine guns, some are equipped with Brügger & Thomet Foldable Visor Helmet Stocks. 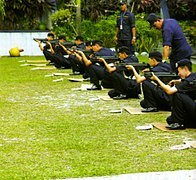 Recruits of Malaysian Police Force training with their MP5's. The West German Marxist militant group Red Army Faction depicted the MP5 in their insignia, shown here. ^ Savannah de Tessières (January 2018). At the Crossroads of Sahelian Conflicts: Insecurity, Terrorism, and Arms Trafficking in Niger (PDF) (Report). Small Arms Survey. p. 58. ISBN 978-2-940548-48-4. ^ "Heckler & Koch – USA". Hk-usa.com. Archived from the original on 2013-05-14. Retrieved 2012-12-29. ^ a b Tilstra 2012, p. 42. ^ "H&K Web site, MP5 overview". Heckler-koch.com. Retrieved 2012-12-29. ^ Dockery 2007, p. 220. ^ a b Thompson 2014, p. 8. ^ Grine, Joe (February 9, 2013). "Gun Review: HK SL8-6". The Truth About Guns. Retrieved January 7, 2015. ^ "Gun Review HK SL8-6". 2010. ^ a b c d "Report: Profiling the Small Arms Industry". World Policy Institute. November 2000. Retrieved 2010-07-15. ^ Thompson 2014, p. 12. ^ a b c d e Thompson 2014, p. 18. ^ a b c d e f g h i Thompson 2014, p. 19. ^ a b c d Thompson 2014, p. 68. ^ Thompson 2014, p. 24. ^ Cutshaw 2011, p. 154. ^ a b Thompson 2014, p. 29. ^ Thompson 2014, p. 47. ^ a b c Thompson 2014, p. 30. ^ a b c d e f g Thompson 2014, p. 20. ^ a b Thompson 2014, p. 23. ^ a b c d e f g h i j Thompson 2014, p. 13. ^ a b c d e Thompson 2014, p. 15. ^ Thompson 2014, p. 21. ^ "Heckler & Koch :: Product Overview - SP5K". www.heckler-koch.com. ^ "MKEK - Mechanical and Chemical Industry Company". mkek.gov.tr. Archived from the original on 2016-08-21. Retrieved 22 August 2016. ^ "MKE (AT94K/AT94P) Turkish HK Contracts..." Retrieved 11 July 2016. ^ "Unnamed: India's Ordnance Factory Board 'ANAMIKA' MP5 - The Firearm Blog". thefirearmblog.com. 16 June 2016. Retrieved 22 August 2016. ^ "Norinco NR08: Chinese MP5 Clone -". 29 October 2010. ^ "NORINCO NR08A – czyli klon HK MP5 – KOLEKCJA 061 – broń i akcesoria". ^ a b "H&K MP5 Clones of the World -". 1 February 2017. ^ "Hellenic Defense Systems". Eas.gr. Retrieved 2009-06-26. ^ a b Thompson 2014, p. 69. ^ "Infantry Weapons – SMG PK". Pakistan Ordnance Factories. ^ Firearms, Atlantic. "POF-5 9mm Semi Auto Pistol, Pakistan Ordnance Factories ( POF )". Archived from the original on 2016-06-08. Retrieved 11 July 2016. ^ Firearms, Atlantic. "POF 5PK 9mm Pistol". Archived from the original on 2016-09-21. Retrieved 11 July 2016. ^ "MP5 Submachine Gun Cal 9X19 mm". En.mic.org.sa. Archived from the original on 2012-12-25. Retrieved 2012-12-29. ^ "Military Industry Corporation (MIC) Official Website". Mic.sd. Archived from the original on 2009-07-09. Retrieved 2009-06-26. ^ "Turkey MKEK MP5". MKEK. Archived from the original on 2009-06-18. Retrieved 2009-06-26. ^ Bhatia, Michael Vinai; Sedra, Mark (May 2008). Small Arms Survey (ed.). Afghanistan, Arms and Conflict: Armed Groups, Disarmament and Security in a Post-War Society. Routledge. p. 165. ISBN 978-0-415-45308-0. ^ Bhatia & Sedra 2008, p. 277. ^ "Viktimat u vranë me plumba 9mm". Top-channel.tv. 2011-01-23. Retrieved 2012-12-29. ^ a b c d Gander, Terry J.; Hogg, Ian V. Jane's Infantry Weapons 1995/1996. Jane's Information Group; 21 edition (May 1995). ISBN 978-0-7106-1241-0. ^ "Weapons: Royal Australian Air Force". Archived from the original on 9 January 2009. Retrieved 9 January 2009. ^ "TAG East operations (image)". Retrieved 11 July 2016. ^ "TRG raid McLeod rental property". Perthnow.com.au. 2010-01-13. Retrieved 2012-12-30. ^ a b c d e f g Thompson 2014, p. 67. ^ a b c d e f g h i j k l m n o p q r s t u v w x Jones & Ness 2009, p. 514. ^ "MP5 Submachine Gun". BDMilitary.com – The voice of the Bangladesh Armed Forces. Retrieved 2010-06-24. ^ "АЛМАЗ – антитерор". YouTube. Retrieved 2012-12-29. ^ "KGB vs FSB shooting". YouTube. Retrieved 2015-01-03. ^ Ezell, Smith & Smith 1973, p. 286. ^ "Etpu" (PDF). Defense Treaty Ready Inspection Readiness Program. Archived from the original (PDF) on 2011-07-22. Retrieved 2011-01-29. ^ Dan Beaumont ARCHIVES (3 December 2011). "Denis Lortie " fusillade au Parlement de Québec ", SRC, 8 mai 1984". Retrieved 11 July 2016 – via YouTube. ^ "CASR — Canadian American Strategic Review — DND 101 — Canadian Forces Small Arms — Specialist Weapons — A Visual Guide". Retrieved 2014-03-03. ^ "Chongqing police SWAT team". YouTube. 2011-03-24. Retrieved 2012-12-29. ^ "Rare guns in China. Used by police and military". YouTube. 2016-12-23. Retrieved 2016-12-23. ^ "uea21". YouTube. 2009-02-15. Retrieved 2012-12-30. ^ "U ATJ Lučko završen tečaj FBI-a". Ezadar.hr. Retrieved 2012-12-29. ^ "zbrane.indd" (PDF). Retrieved 2010-06-24. ^ "Policía y CTE realizan intercambio de armas" (in Spanish). Telerama. 2011-06-07. Retrieved 2012-06-19. ^ Bennett, R M (31 August 2011). "Egypt". Elite Forces. Ebury Publishing. pp. 199–200. ISBN 978-0-7535-4764-9. Retrieved 19 August 2013. ^ Capie, David (2004). Under the Gun: The Small Arms Challenge in the Pacific. Wellington: Victoria University Press. pp. 70–71. ISBN 978-0864734532. ^ "Terre – HK MP5 A5" (in French). Defense.gouv.fr. Archived from the original on March 14, 2008. Retrieved 2009-06-26. ^ "Terre – HK MP5 SD3" (in French). Defense.gouv.fr. Archived from the original on March 16, 2008. Retrieved 2009-06-26. ^ "Heckler & Koch HK MP5 Submachine Gun (SMG) / Machine Pistol - Germany". ^ "Modern Firearms – Heckler Koch HK MP-5 submacine gun". World.guns.ru. Archived from the original on 2010-06-17. Retrieved 2010-06-24. ^ "Maschinenpistole MP5K". streitkraeftebasis.de. Retrieved 2010-06-24. ^ a b c , Miller, David (2001). The Illustrated Directory of 20th Century Guns. Salamander Books Ltd. ISBN 978-1-84065-245-1. ^ a b "Спецпідрозділ "ОМЕГА"". YouTube. Retrieved 2012-12-29. ^ "Hong Kong Police – Airport Security Unit". hkdigit.blogspot.com. 2007-06-12. Retrieved 2010-10-31. ^ "Gæslan keypti hríðskotabyssur". Retrieved 11 July 2016. ^ "Force One to get MP5 guns". dnaindia.com. 2009-01-16. Retrieved 2010-06-24. ^ Unnithan, Sandeep (August 22, 2008). "If Looks Could Kill". India Today (Online). Retrieved 2009-04-04. ^ "ARW Equipment". Fianoglach.ie. Archived from the original on 2009-03-13. Retrieved 2010-06-24. ^ "Arma dei Carabinieri – Home – L'Arma – Oggi – Armamento – Armamento speciale – Pistola Mitragliatrice Heckler & Koch MP5". Carabinieri.it. 2005-11-16. Retrieved 2012-12-29. ^ "SBU（海上自衛隊特別警備隊）の動画". Special-operations.info. Archived from the original on 2013-04-28. Retrieved 2012-12-29. ^ 日本の特殊部隊 (in Japanese). Archived from the original on 2012-11-17. ^ "Unofficial SST Page" (in Japanese). Archived from the original on 2013-02-07. Retrieved 2010-05-27. ^ "自衛隊の採用する銃器". Jieitaisaiyou.web.fc2.com. Retrieved 2012-12-29. ^ Rottman 1993, p. 53. ^ Erzhik Erzhanov (21 March 2012). "Казахский СПЕЦНАЗ мочит терроров ГАЗом" – via YouTube. ^ "Germany's Unseen Hand in Kenya Crisis". The African Executive. 2008-02-06. Archived from the original on 2013-05-16. Retrieved 2012-12-29. ^ a b Jenzen-Jones, N.R. ; McCollum, Ian (April 2017). Small Arms Survey (ed.). Web Trafficking: Analysing the Online Trade of Small Arms and Light Weapons in Libya (PDF). Working Paper No. 26. p. 85. ^ "Annual Report 2011 > Landespolizei" (PDF). Landespolizei. Retrieved 2012-06-18. ^ "About the Security Corps > Landespolizei" (PDF). Landespolizei. Retrieved 2012-06-18. ^ "Lietuvos kariuomenė :: Ginkluotė ir karinė technika » Pistoletai-kulkosvaidžiai » Pistoletas – kulkosvaidis MP-5" (in Lithuanian). Kariuomene.kam.lt. 2009-04-17. Retrieved 2012-12-29. 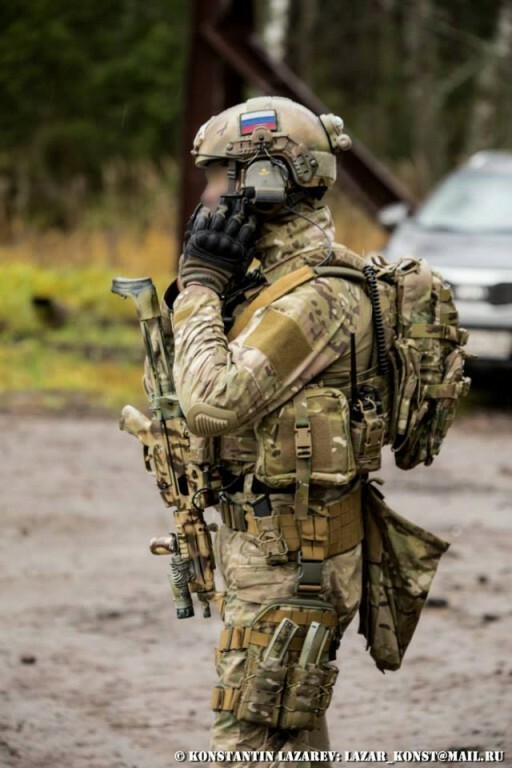 ^ "Lithuania: Special Operations and Counterterrorist Forces". Special Operations.Com. Archived from the original on 2013-10-06. Retrieved 2013-10-05. ^ "Equipement :: Unité Spéciale de la Police". USP.LU. Archived from the original on 2011-07-22. Retrieved 2010-06-24. ^ "Ops Daulat Ground Operation, Lahad Datu Crisis picture gallery". malaysiamilitarypower.blogspot.com.au. Retrieved 31 January 2015. ^ Royal Malaysia Police (July 2009). "Airport Security Course 1/2009". Royal Malaysia Police. Retrieved 2015-07-24. ^ Royal Malaysian Customs Academy (2010). "Royal Malaysian Customs Academy: Firing range". Royal Malaysian Customs. Retrieved 2011-08-22. ^ Muhammad, Zuridan (July 2009). "Malaysian Special Forces". TEMPUR. Retrieved 2013-07-20. ^ Thompson, Leroy (December 2008). "MAST – SWAT Team of Marine Police". Special Weapons. Archived from the original on 2013-07-20. Retrieved 2009-11-29. ^ "United Nations Register of Conventional Arms". Un.org. Retrieved 2012-12-30. ^ "Dienst Koninklijke en Diplomatieke Beveiliging (DKDB) KLPD". Arrestatieteam.nl. Archived from the original on 2011-02-24. Retrieved 2011-01-29. ^ "En liten røver med trøkk i (Norwegian article on the Heckler & Koch deal)". Mil.no. Archived from the original on 2007-09-27. Retrieved 2012-12-29. ^ "Kjent skyldig av juryen – beskyttes av væpnet politi – VG Nett om Gjengkriminalitet". Vg.no. 2009-05-27. Retrieved 2012-12-29. ^ "Pakistan Army". Archived from the original on 2013-05-13. ^ Montes, Julio A. (August 2011). "Peruvian Small Arms: Gunning for the Shining Path" (PDF). Small Arms Defense Journal: 25–29. ^ "Rice Not Guns – German Arms in the Philippines". Bits.de. Retrieved 2010-06-24. ^ Mateus, Bruno Contreiras (July 6, 2008). "Superpolícias Preparados para o Pior" (in Portuguese). Correio da Manhã. Retrieved 2009-10-23. ^ "Blue Paper :: 아덴만 여명작전! 부산에서 재현되다!". Blue-paper.tistory.com. 2012-01-20. Retrieved 2012-12-30. ^ de Mihai DIAC (5 March 2008). "Armament ultrasofisticat pentru Forţele Speciale ale Armatei Române – Gandul". Gandul.info. Archived from the original on 10 August 2011. Retrieved 2013-08-08. ^ Sorin A. Crasmarelu (2006). "Romanian Intelligence Service's Anti-Terrorism Brigade". geocities.ws. Retrieved 2015-12-07. ^ "Спецподразделения МВД вооружатся австрийскими пистолетами". Lenta.ru. Retrieved 2012-12-29. ^ "Фото". Retrieved 11 July 2016. ^ "Singapurske Specijalne Postrojbe" (in Croatian). Hrvatski Vojnik Magazine. Archived from the original on 2009-10-15. Retrieved 2009-10-25. ^ "Home Team Convention" (PDF). Police Life Monthly. 37 (9): 7. September 2011. ISSN 0217-8699. Archived from the original (PDF) on 2013-05-26. Retrieved 3 February 2012. ^ "Vigilance, Valour and Victory" (PDF). Police Life Monthly. 37 (1): 22. January 2011. ISSN 0217-8699. Archived from the original (PDF) on 26 May 2013. Retrieved 3 February 2012. 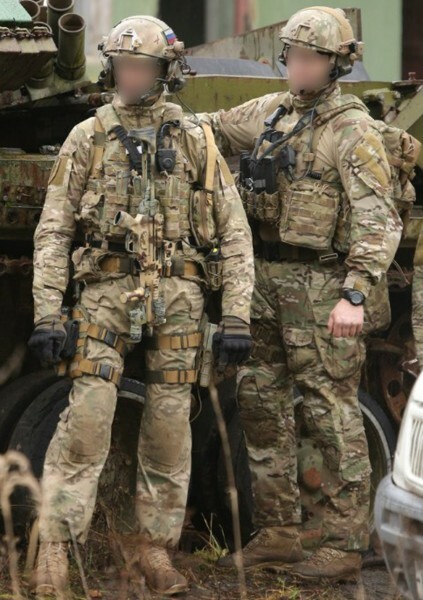 ^ "Official page of Slovak special units" (in Slovak). ^ "Special Police Unit exercise". Policija.si. 2011-08-02. Retrieved 2012-12-29. ^ "Carte Blanche – M-Net". Beta.mnet.co.za. Archived from the original on 2010-12-10. Retrieved 2011-01-29. ^ "Web Del Grupo Especial De Operaciones (GEO)" (in Spanish). Official Website of the Spanish National Police Corps. Archived from the original on 2011-05-20. Retrieved 2014-07-15. ^ Henrik Svensk. "kulsprutepistol 45 b kpist k-pist 45". Soldf.com. Archived from the original on 2010-08-22. Retrieved 2010-06-24. ^ "Press – Police Ombudsman for Northern Ireland". Policeombudsman.org. Archived from the original on 2010-12-14. Retrieved 2011-01-29. ^ Moore, Matthew (2009-10-22). "Armed officers placed on routine foot patrol for first time". Telegraph.co.uk. Retrieved 2012-12-29. ^ "Sussex Police Uncovered – Tactical Firearms Unit". Archived from the original on 2010-01-16. ^ "HECKLER AND KOCH MP5 SMG". Olive-drab.com. Retrieved 2012-12-29. ^ Ambinder, Marc (March 2011). "Inside the Secret Service". The Atlantic. Retrieved 25 December 2011. ^ Moore, Malcolm (2008-06-11). "Pope Benedict XVI sets up anti-terrorist squad". The Daily Telegraph. London. ^ "Trung Quốc 'choáng': CSCĐ Việt Nam dùng 'Súng bẻ góc' Israel". baodatviet.vn. ^ Patrick Donahue (February 12, 2007). "German Red Army Faction Member Wins Early Release". Bloomberg. Retrieved December 12, 2011. Cutshaw, Charles Q. (28 February 2011). Tactical Small Arms of the 21st Century: A Complete Guide to Small Arms From Around the World. Iola, Wisconsin: Gun Digest Books. ISBN 978-1-4402-2709-7. Jones, Richard D.; Ness, Leland S., eds. (2009). Jane's Infantry Weapons 2009/2010 (35th ed.). Coulsdon: Jane's Information Group. ISBN 978-0-7106-2869-5. Tilstra, Russell C. (2012). Small Arms for Urban Combat. US: McFarland. ISBN 978-0-7864-6523-1. Archived from the original on 2012-05-09.